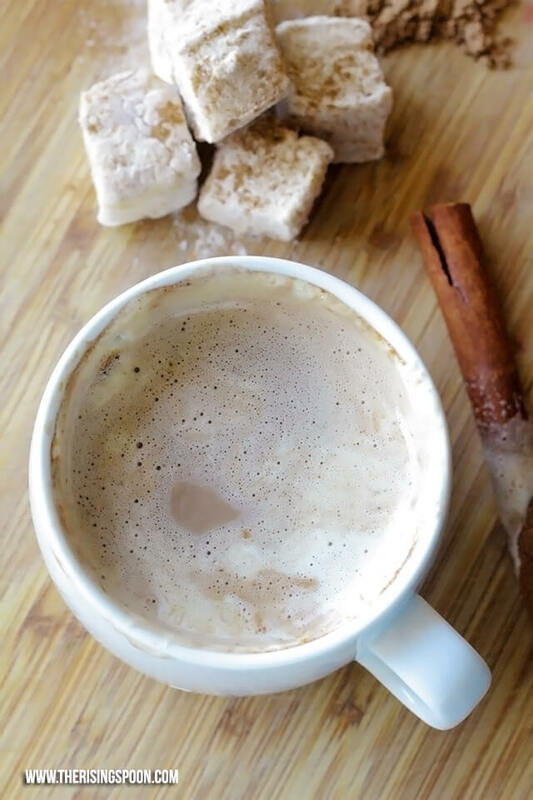 Learn how to make a decadent & healthy hot cocoa recipe on your stove-top in minutes using cacao powder (or unsweetened cocoa powder), cinnamon powder, cayenne pepper, sea salt, and your favorite sweetener + milk (dairy or dairy-free). 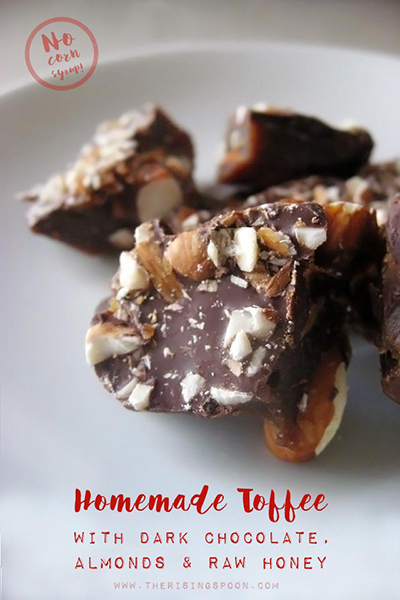 Once you go homemade you'll never want to use the store mixes again. Pretty much all of the hot chocolate & cocoa I drank growing up was commercial mixes stirred into either hot water or milk. I wasn't picky. Give me some sugary chocolate liquid topped with whipped cream to sip on and I was happy. 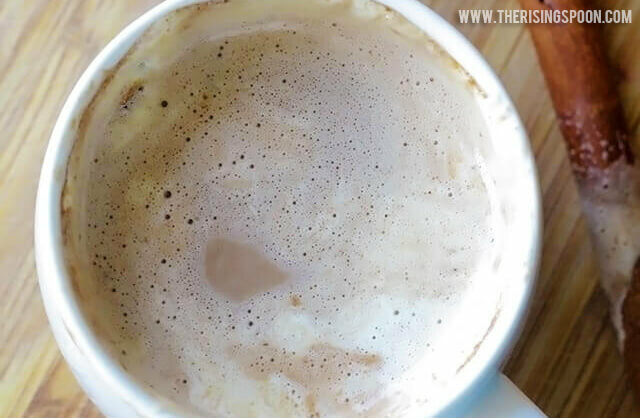 When I started drinking coffee in my late teens, cocoa went to the back-burner and hardly ever ordered it (a regular or white chocolate mocha was the closest to it). Many years went by and I started drinking it again on occasion as a treat. Usually those little white & blue packets (my American readers know what brand I'm talking about) stirred into water or sometimes milk. This time around, something was different. Instead of feeling all warm, cozy & satisfied (as you should be after drinking cocoa), I'd get 3/4 through a mug of hot chocolate and develop an upset stomach. And I wasn't the only one. As it turns out, at least two of my co-workers at the bar & grill I served at back in college had the same habit as me. Near the end of our closing shift (between 1 and 2 a.m.) we'd sometimes fix ourselves a cup of hot cocoa using hot water and one of those popular packets. And then not long after we'd end up feeling gross and totally regret our decision. So why the major change in how my body felt after drinking hot chocolate/cocoa? Maybe my kid stomach was more tolerant. (After all, I was drinking a bunch of soda and eating lots of processed foods back then.) Or, it could be that the mixes I grew up drinking had different ingredients back then than today. I'm leaning toward the latter reason since I actually know what's in those store-bought mixes now and...guys...it's not as simple & wholesome as you'd expect. 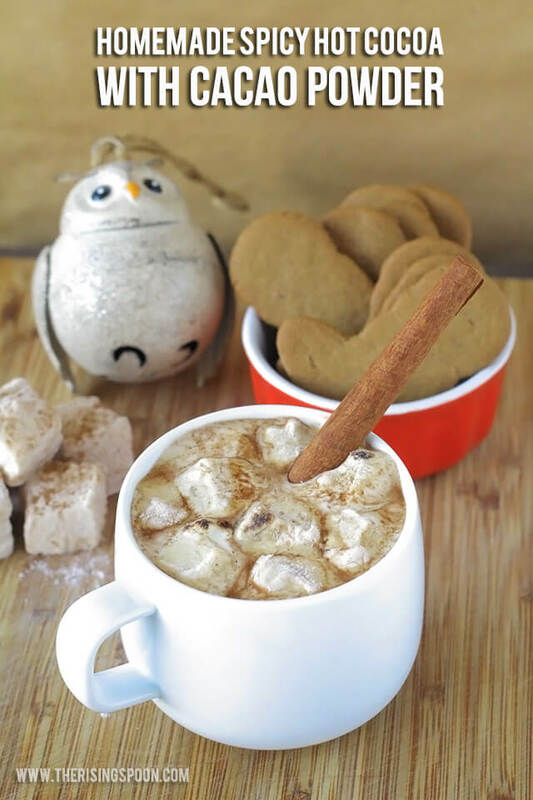 Hot cocoa or chocolate mixes only requires three basic ingredients: cocoa powder, powdered milk, and sugar. No wonder we were getting stomach aches every time we drank this stuff. Now that I've jaded your perception of commercials hot chocolate mixes, let me present you with a recipe for inexpensively making your own SUPERIOR version at home. One that's rich, decadent and chocolatey, but made with simple ingredients. You can feel good about drinking a cup anytime you need a warm and comforting beverage, whether that's for breakfast or dessert. Before we get to the recipe, let me go over the basic hot cocoa ingredients so you can see all your options in case you want to experiment or do some swaps. Chocolate: For a rich, more pronounced chocolate flavor, I use this organic raw cacao powder as the base for my hot cocoa. It's high in potassium, magnesium, fiber, antioxidants, and polyphenols. I keep it on hand for baking, sugar scrubs, smoothies, and homemade chocolate sauce& syrup. You can also use baking cocoa or cocoa powder (it goes by several names), just make sure you choose an unsweetened variety (and keep in mind these won't be as intensely chocolatey as cacao). Sweetener: Since the cacao is so intense by itself, you'll need some sweetener to help balance it out. 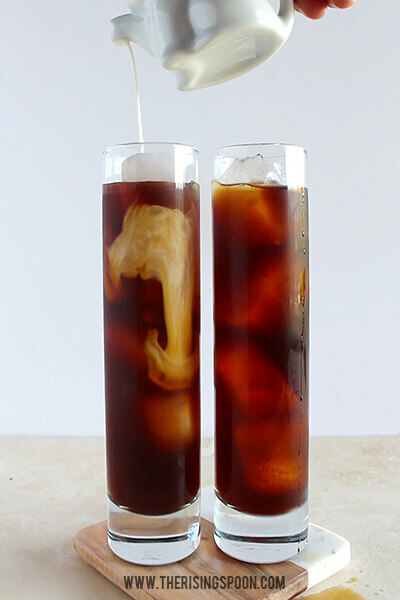 I've used cane sugar, powdered sugar, honey, and maple syrup for this drink (all the same amounts) with great results. You could also try coconut sugar, vanilla infused sugar, maple sugar, sucanat, black strap molasses, or brown sugar with the same measurements, but low carb sweeteners like stevia will require much less. 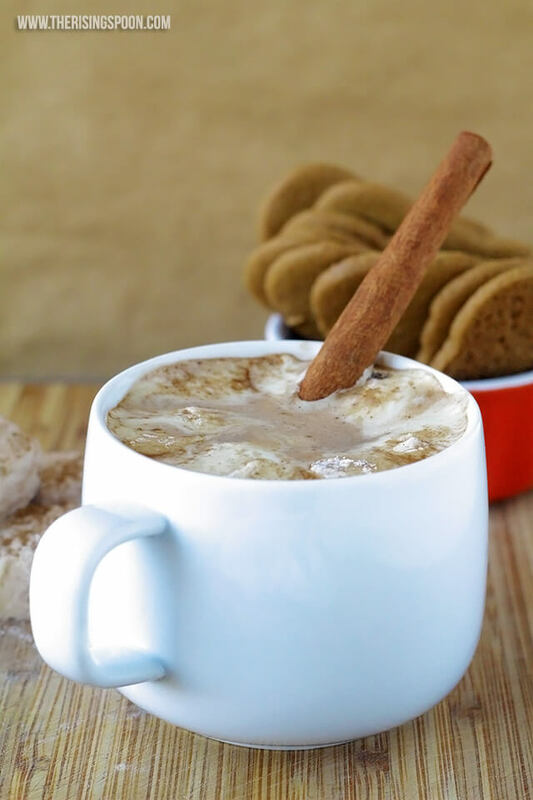 Spices: A basic hot cocoa recipe doesn't require extra spices, but I like to jazz mine up a bit to mimic a Mexican hot cocoa. So I add a bit of this Ceylon cinnamon powder, cayenne power, and sea salt. 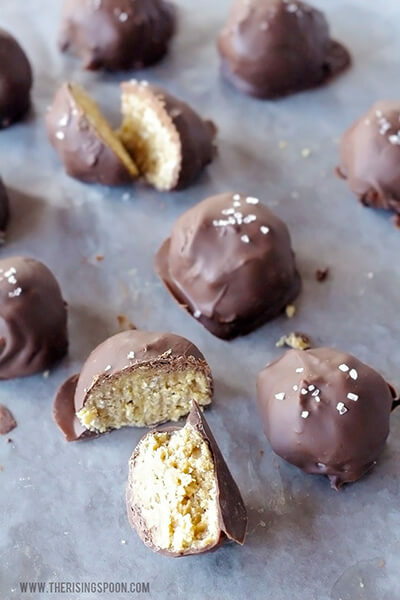 These are totally optional, but pair super well with the chocolate flavors. 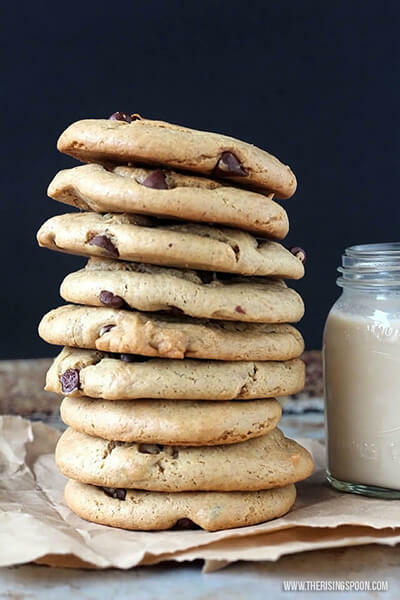 Milk: My favorite milks to use for this recipe are homemade almond milk, homemade coconut milk, or raw cow's milk (raw is easier on my stomach than pasteurized & tastes a million times better). Cashew milk would be another good option, although be aware that almost all store-brand nut milks have emulsifiers (like carrageenan) in them, which you may want to avoid. Toppings & Mix-Ins (Optional): If you have some heavy whipping cream on hand and an extra five or ten minutes to spare, I highly recommend making a batch of homemade whipped cream for topping your hot cocoa. For a dairy-free version, you can also use the cream from canned coconut milk for coconut whipped cream. If you're feeling extra fancy, top the whipped cream with chocolate chips or shavings. Oooooooo! And then there's always marshmallows (classic). My favorite is these homemade honey-sweetened marshmallows from my friend Emily of Recipes to Nourish. I've been making them every Christmas for the past few years and love them. Measure the cacao, spices, and sweetener into a small saucepan set to medium-low heat. Pour in a little bit of milk and stir the mixture until it's completely dissolved (this should only take a minute or so). Add the rest of the milk and heat for a few minutes until hot & steamy, but not boiling. Pour into your favorite mug, top with whipped cream (if desired) and drink immediately. Before you jump into the instructions, make sure to watch my short recipe video by clicking below. 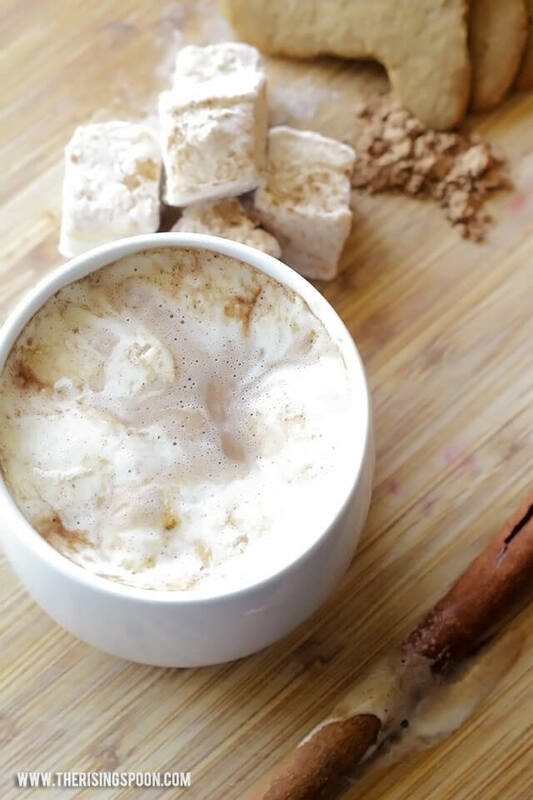 It illustrates the super easy process of making homemade hot cocoa with cacao powder! Measure the cacao powder, preferred sweetener, cinnamon powder, sea salt, and cayenne pepper into a small saucepan. Turn the heat to medium and slowly pour 1/4 cup of the milk into the spices, stirring constantly until the sweetener has dissolved and all the spices are mixed together, making sure to press out any lumps with the back of your spoon. When the mixture is smooth, stir in the rest of the milk and heat the cocoa until it's warm enough to drink (don't let it boil over). 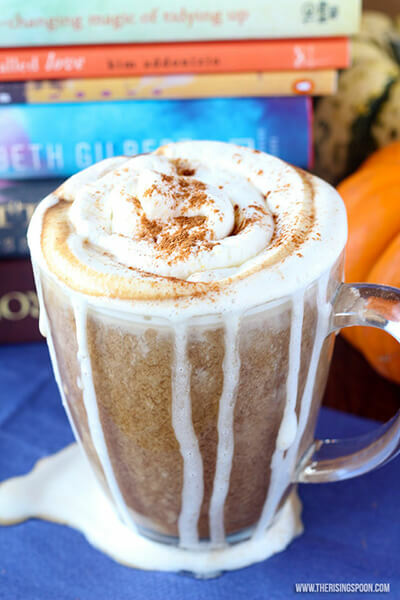 Pour into your favorite mug and drink right away, or dollop some whipped cream or sliced marshmallows on top sprinkled with extra cinnamon and cayenne. Enjoy! 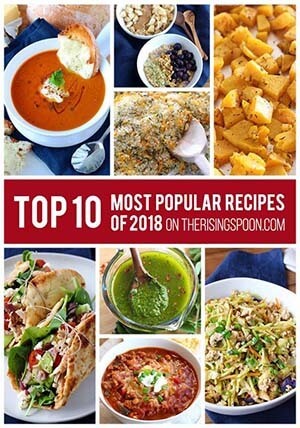 This recipe is meant for one person, but it'll work just the same if you want to make a batch for a group - just double the recipe as many times as you need and use a bigger pan. 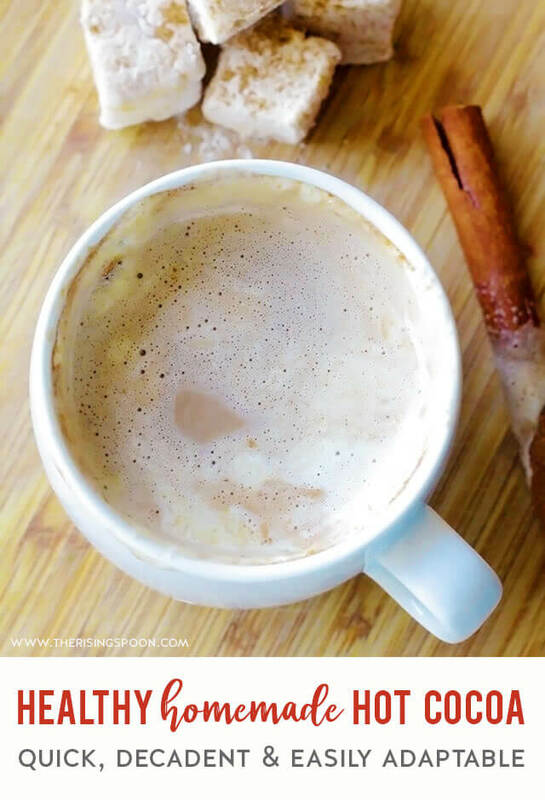 For traditional hot cocoa, simply leave out the cinnamon, cayenne pepper, and salt. This is REALLY yummy mixed 50/50 with freshly brewed dark roast coffee. It makes an amazing mocha-esque drink! Update (November 2015): I fixed this recipe again so I could take new pictures & try it with homemade marshmallows + coconut milk. 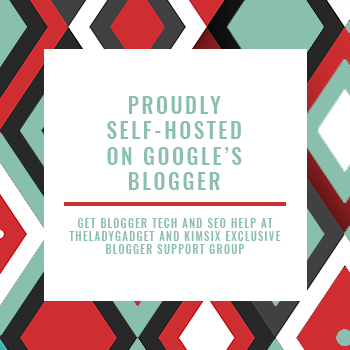 Update (October 2017): I re-wrote a good chunk of this post to improve the clarity and to add extra steps + recommendations and gave it a printable recipe card for convenience. So true! Thank you so much for the info about the artificial stuff. I have been wondering why I feel so bad after drinking something that tastes good. I am so switching to the natural ingredients you listed. Thank you and keep sharing, your voice is being heard!